Producer describes it as "two kings working together"
Timbaland: he's worked with 'em all. Since his death in 2009 we've had various 'new' Michael Jackson releases, including the rather underwhelming Michael album, a compilation of previously unheard tracks. The King of Pop remains a source of inspiration for today's artists and producers, so it probably shouldn't come as any great surprise to learn that Timbaland has now suggested that he's working on Jackson material. 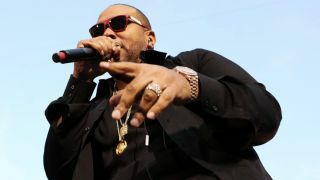 The project will feature "My music and his vocals," says Timbaland in the RevoltTV video below, with the first single set to be called Chicago. Whether this is a new version of Chicago 1945, a song that Jackson is said to have originally worked on during the Bad sessions, remains to be seen. Timbaland also says that producer L.A. Reid is involved in the project.